"Voici la Ferme des Pommiers." This is Apple Tree Farm. 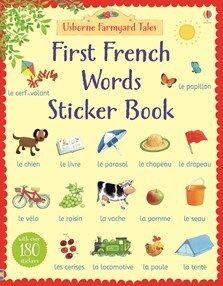 Children will find it easy to learn common French words and simple phrases with this colourful sticker book set on Apple Tree Farm. Each double page shows a large, busy scene on the farm, with pictures of animals, fruit and vegetables and toys clearly labelled in French. Featuring the much-loved illustrations of Stephen Cartwright and the classic characters Woolly the sheep, Curly the pig and Rusty the dog. With over 100 colourful stickers for children to match to the labelled pictures. Children can listen to the words read by a native French speaker at the Usborne Quicklinks Website.